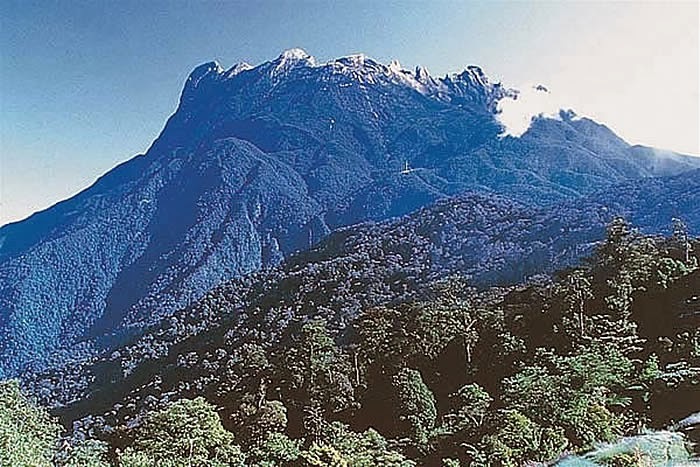 It's not that I've always wanted to climb Mt Kinabalu (at 4,092m the 'highest mountain in South East Asia'*), but let's just say that the idea has taken some shape over the last couple of years having discovered that you can climb it, given a modest degree of fitness. So that's what all the stair-walking has been about. So leaving Liz and the girls asleep, I'm picked up at 5:30am and am driven into Sabah's interior. The mountain is easily spotted from Kota Kinabalu and it looks nearer / not as high as I'd anticipated. Then a strange thing happens, the nearer we get, the further it seems to be, and higher. Finally we reach the Park Gate, sign in and set off at 9:00am. 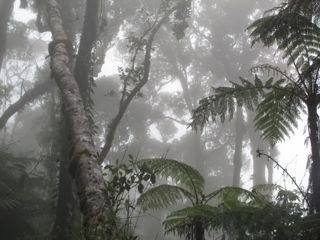 It's a long hard slog through forest, relentlessly, inexorably, mercilessly up. I have a guide, Sylvester, but he stays a few steps behind me allowing me to walk at my own pace. On the one hand I want to share this with Liz, like we did in Nepal, on the other hand it's mostly too tiring to talk. There are shelter/rest points all the way up and I look forward to each and every one of them. Halfway up it starts to rain and I'm thankful for my bicycle poncho. It becomes even more of a slog as the trail, already rough, turns into a steep, red rock-strewn stream and it takes all one's effort to step from one slippery rock to another, all the time up, up, up. Finally we reach the overnight lodge at 3,272m. Four and a half hours. I'm quite chuffed. I have three hours to kill and recover as the lodge fills up with more & more trekkers and a buffet dinner is served. Really nice atmosphere: all nationalities, all ages, all sharing their stories about how tough and wet it was. Then off to the dorm, in bed at the absurdly early 7pm and a fitful half-a-night's sleep, courtesy of cold, altitude and party-goers.